Discussion in 'Other Android Tablet Manufacturers' started by thatcomicsguy, Mar 18, 2016. 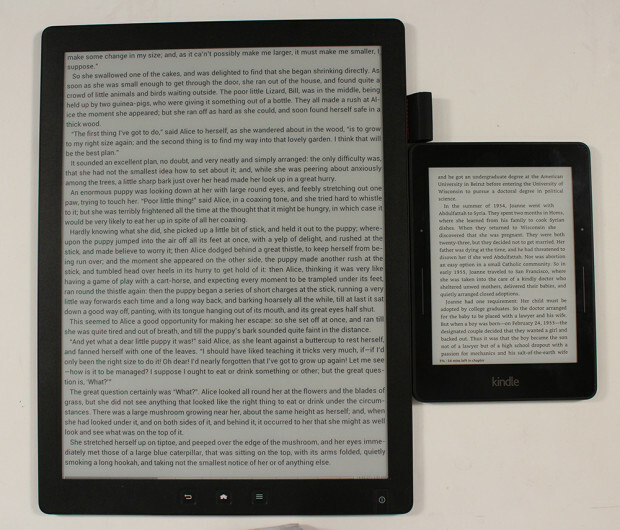 This looks like a great e-reader! They only need 60 orders to cover build cost. This is amazing. Thanks for sharing. I have to see if I can scrounge up the cash. This would be so amazing for sheet music at outdoor gigs. And it would actually run a legit sheet music reader rather than just trying to make a pdf reader do enough. Compared to Sony's offering it looks like a bargain, to everything else it is "are you kidding me with that price?" Nice that they use the Moebus screen but RAM is a little tight. If I got one I'd like to run Office for Android on it and you can't do that with the RAM and version limitation. I've always felt that industry abandoned eInk just as it was getting going. I love the idea of using reflected ambient light rather than back-lighting. It is technically impossible to use back-lighting on an e-ink screen. Front-lightning is an option though. I had missed the Android version. It'll run my score reading app (MobileSheetsPro) but not One Note, which is kind of a huge miss. I usually have at least one machine sitting around which is only used as a music reader. It's the one thing I do that absolutely has to work when it has to work so I like having a dedicated machine. I always thought it would be neat to have an eink screen for music, as light up screens can be distracting on stage and aren't the best outdoors. But it would be really neat if it could run one note also. I wonder if any community enthusiasts will pick up the software and try to update it to a more current version of Android. While the price is better than Sony's offering, I guess it is high in comparison to non-eink things. I'm currently using an HP Pro Slate 12 that I found refurbed on ebay for cheap for music right now, and this is more than twice what I paid for the pro slate. I only just stumbled across this today and found it a really interesting device. With One Note it would be all a student would need for taking notes, reading scanned textbooks and marking up pdfs. Well, if you like to get scammed, please go ahead and order one.